Since about the age of 18, my body has rejected dairy products. If I drink milk, eat something with cheese or cream, I get a terrible stomach ache. Not being able to drink milk anymore is no problem since I never really liked it anyway. And nowadays it's quite easy to get soy anything. As you can see in the pictures, I eat soy yogurt, soy ice cream and eat my cereal with soy milk. I recommend you dairy lovers out there to try switching to soy. It's healthier for you! Soy milk reduces cholesterol. Soy milk contains no hormones nor lactose. Soy milk contains only vegetable proteins. Soy milk is also rich in isoflavones, also known as cancer-fighting chemicals. Do you know where soy milk comes from? The same country which has brought us paper, gunpowder, printing and silk also began the cultivation of soybeans earlier than 2000 BC. Of course, this country is China. Today, Brazil is the leader in soybean production as it surpassed the US a few years ago. My other soy food favorites are: EDAMAME - a small green soybean that is usually boiled and served as a side dish, TOFU - made from soymilk that is curdled with mineral salts, MISO - a fermented soybean and grain paste that is used as a soup base. Here are a few things to think about before you drink your next glass of milk. 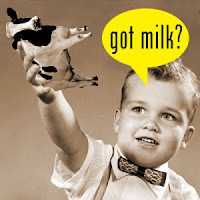 Isn't it strange that humans are the only animals that drink milk into adulthood. Is it natural for humans to drink cow's milk? So why do so many people swear by milk? Maybe it's because the Dairy Industry spends over $100 million dollars to build a demand for dairy products in the US. Lastly, did you know that the over 9 million cows in the US produce about 100 pounds of methane each per year? That amounts to almost a billion pounds of methane gas released into the atmosphere each year. This means that "Beef is a greenhouse-intensive food" and a major cause of global warming (with dairy a significant part of the problem). I'll end by saying, in spite of all this, I still truly miss a nice CHEESE pizza!